Residential or commercial, Rancho Penasquitos Plumbers fix, repair, remove, replace, and install new plumbing fixtures, kitchen faucet, valves, risers, toilets, toilet fill & flush valves, shower valve cartridge, water supply lines, lavatory and kitchen sink basin installs, spigot, pop up, hose bib garbage disposal repair and/or replacement, dishwasher hook-up, and water pressure regulator installs, and water heaters, recirc. Rancho Penasquitos Plumbers provide rooter services and unclog all clogged sewer drains anytime, mainline, branch, floor drain sink mop sink, kitchen sink, bath tub, lavatory, shower or toilet by way of clean out and vent stack cabling, cable, snake snaking and hydro-jet – high pressure water cleaning to remove sludge in the lines. We work with traps, copper pipe, abs, pvc, corex, french, area, yard, pool and patio drains, we auger toilets. We are an rootx dealer for root killer product. we also offer camera and location services for your drains and a free consultation in San Diego County. Rancho Penasquitos Plumbers are licensed to conduct business in most of the cities in San Diego county. We are service technicians and only perform smaller jobs as listed above. We do not offer new construction, remodels, re-pipes, re-routs or repair concrete slab leaks. However, we can refer other companies to you. Rancho Penasquitos Plumbers have been in business for many years now providing quality and affordable services to many thousands of satisfied customers in the San Diego County area. 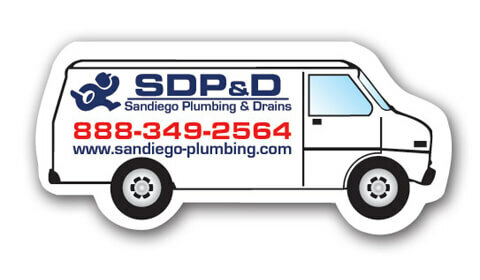 Call SDP&D toll free at 888-349-2564. you’ll be glad you did!